Pocatello, Idaho. There was a lot of lightning early this morning 2 – 6AM. Now there is a rapidly growing fire (see photo) north of Pocatello Creek on the southern boundary of the Indian Reservation burning in sagebrush, grass, some thick juniper and aspen. It has spread rapidly. It has been named the 2 1/2 Mile road fire. Air tankers are now hitting it and seem to be stopping its spread to the south — towards houses. Update on 8/22. The fire is nearing control, but there is worry about the west side which is in rugged territory. About 40 homes were potentially threatened, but fire retardant drops stopped the fire miles from the homes although the fire’s path was toward them. On the other side of valley, there is a fire in the Arbon Valley area. Most of the fire fighting resources seem to be devoted to it because it is threatening rural homes in Power County. Homes have been evacuated. 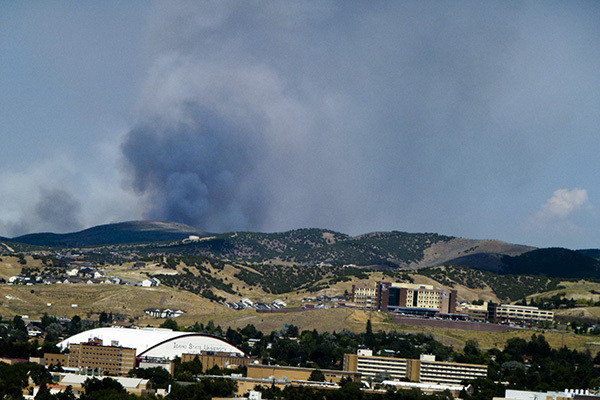 Update: this fire is now under control, but a flare up with afternoon winds (on 8/22) is possible. It is named “The Garden Fire.” It burned over 1700 acres.